Acts of "terror" aren't. Not for me. They don't terrify me in the slightest. But they do make me angry. And they make me think. 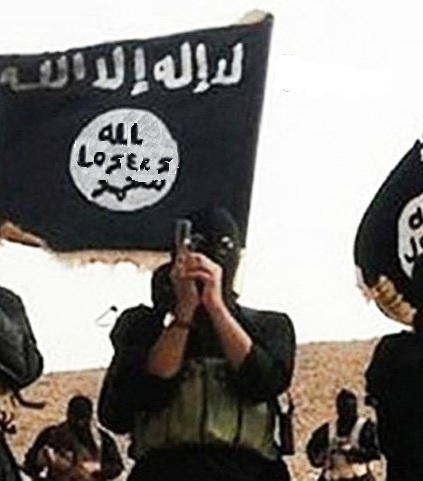 "Terrorists" aren't terrorists if they don't create terror, but-- by killing random people-- they show they are losers. They are all losers. No matter what motivates their acts of loserism. The fact of them being losers renders their motivation irrelevant. Maybe they murder for politics, for their superstitions, or maybe for politics which are more accommodating to their superstitious beliefs. Whatever. It's just that, in the current world in which we live, the majority of the losers who get publicity murder random people in the name of Islam. So, they are Islamo-losers. If they murder for a god, that god (if he exists) is obviously evil. Do they really believe an evil god who lusts for death wouldn't lie to them? Of course he would. Lies come before the call to murder-- they lead up to the murderous mission. If there were an afterlife of any sort, their evil god probably lied to them about that, too. Instead of 72 virgins (or a city with streets paved with gold, for other losers) they would be facing an early entry to an eternal roasting pit. Are they really that anxious to get started right away? Any "leader" of this loser group who encourages them to be losers is also encouraging them-- if he believes what he's pushing-- to hurry up and exit this life so they can get started on the unimaginable suffering they earned by their act of loserism. Congrats on earning that, Losers. Hope you like it better than this miserable life of sunrises, kittens, and people who make you angry. Just so you don't think I'm picking on Islamo-losers, the Pentagon and US government are also filled with people excited by the prospects of engaging in world-wide loserism. They just don't want to die in the process of killing random people, unlike those losers who are happy to kill themselves along with their victims. That doesn't make them any better. I guess they are Imperio-losers. Losers initiate force; the initiation of force makes a person a loser. Don't be a loser. What this world needs is a right and proper bloodbath. I disagree. What the world needs is simply a massive number of people suddenly recognizing that there is no moral difference between government and the mafia / gangs / freelance archators. A bloodbath will only replace one bad government with another.